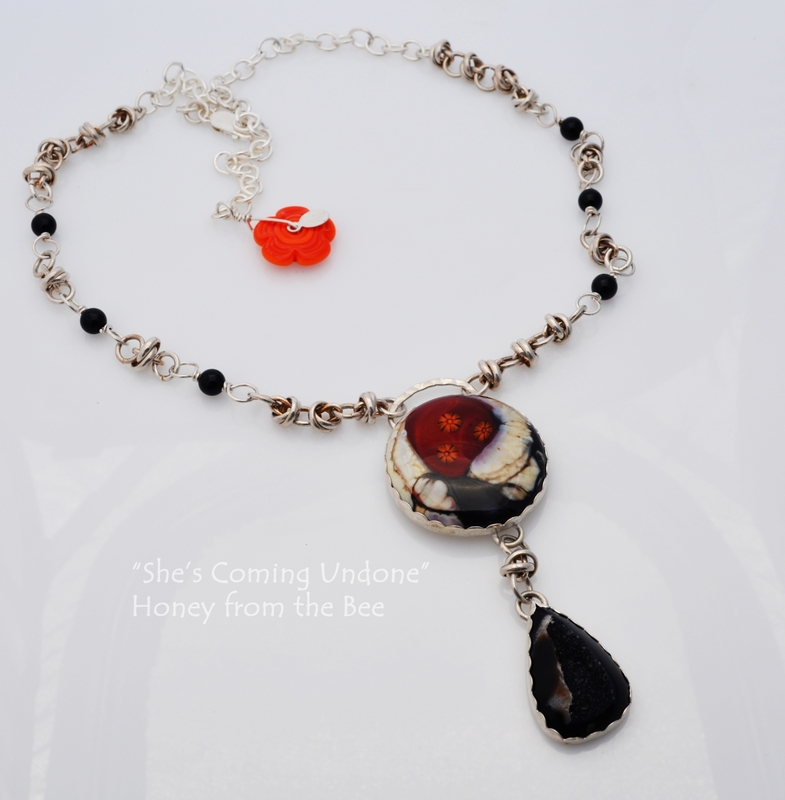 I found inspiration in the lampwork cabochon by Mikelene Reusse and the beautiful sparkling black druzy teardrop cabochon, and call this one of a kind statement necklace: "She's Coming Undone." The pendant I created by bezeling the glass cabochon with Sterling Silver. This gorgeous glass cabochon has swirls of black, white, and brown that seem to open up to a dark red with orange millefiore beneath the covers. The black druzy is also set in Sterling Silver and sparkles like mad. It amazingly has the same colors on the outside of it as the cabochon. They're a perfect match! A personal touch for the owner of this one of a kind piece is the cut-out in the back of the top bezel. It's as if the cabochon itself is starting to free itself! A mix of sterling silver chainmaille and black onyx make up the chain. I've dangled an orange flower lampwork bead by Blue Seraphim off the adjustable part of the chain. Necklace is adjustable with a sterling silver lobster clasp from 16 to 22 inches. The pendant hangs 3 1/2 inches from the top of the bail to the bottom of the druzy. I've been pretty buttoned-up for a lot of my adult life. I am finding it both a little scary and freeing to start coming undone. Maybe you feel the same? The whimsical name for this necklace was inspired by one of my favorite books, She's Come Undone, by one of my favorite authors, Wally Lamb. The Guess Who had a popular song titled "Undun" that might've inspired Wally's book title.